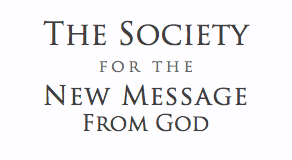 We invite you to join with the Messenger, The Society and others from around the world in bringing to the world The One God, which is the second sacred book of Volume One of The New Message from God. The world must come to learn of this divine text, and those people who are called to it need to be able to find it and engage with its inspiration, wisdom and mystery. Offering the print book at cost — $5/book, through the New Knowledge Library Store. 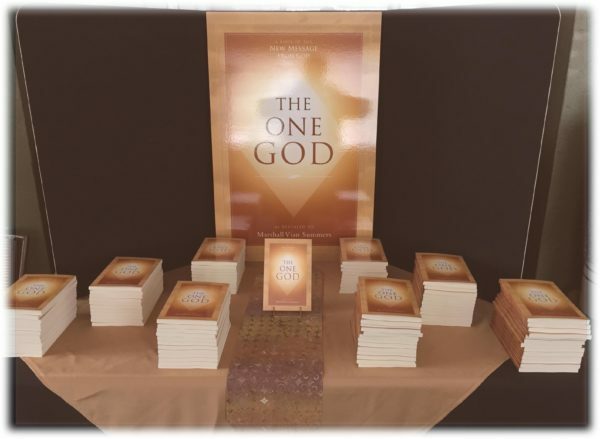 Offering The One God Podcast Audiobook for free on iTunes and via The New Message from God – the original spoken Voice of all chapters of The One God book. To subscribe, search for ‘The One God’ on iTunes or on your podcast app, go to: newmessage.org/theonegodpodcast. Sharing select passages from The One God in text and images on Facebook and Youtube and other platforms, and promoting these to new viewers. Already in the weeks since The One God was released, The Society has reached 632,200 people on Facebook, of which 163,296 people have liked, commented or shared what The Society has published. How can you support The One God Campaign? With your donation directly to The One God Campaign, we can reach hundreds of thousands of people with the truth, mystery and revelation contained in The One God. Using the power of the global internet, a donation of just $100 allows The Society to present The One God to approximately 55,000 new people. This is an unparalleled time in the history of the world, when billions of people are online, are reachable and are searching for a new experience and awareness in their lives. With your help in the months ahead, The One God will be able to reach those who are truly looking for it. Share The One God book with others, bring it with you wherever you go and strike up a conversation, or leave a copy where others who would value this message can find it. However you see to share the book, please do so. 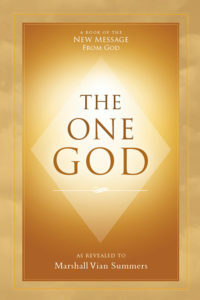 The One God is available at cost for $5/book here. In the weeks ahead, The Society will be releasing videos, photos and text selections from The One God on YouTube, Facebook and elsewhere. Re-share what The Society releases and add your own experience to the communication, either through an original post or a comment. Download, re-post, share and comment on the photos and text published to the New Message Facebook page and The One God Facebook page. Share and comment on the videos of the Voice of Revelation being published to the New Message YouTube channel and the new Wisest Voice in the World page on Facebook. Leave a review of the book on Amazon.com and iTunes. Blog about The One God on Deily.org, Beliefnet, or other locations. Share your experience by commenting under news articles regarding God and religion. Express the valuable teachings and message of this book relative to your own experience of God that the New Message is giving you.